London: Whatever your view on the effectiveness of the deal between Opec and a group of non-member countries to limit oil supply in order to drain excess inventories and boost prices, there is one thing that everybody seems to agree on—they stuck to their guns much better than anyone thought possible for the whole of last year. But there is a growing chorus of voices calling the deal’s demise this year. Here’s why I believe they’re wrong. The most common reasons for suggesting that the deal will fall apart in 2018 are: a growing pressure to cheat, capitulation in the face of surging US shale production, or a declaration of success. Each of these is certainly plausible, but I think the risks are low. “We tend to cheat," former Saudi oil minister Ali Al-Naimi famously observed shortly after the output deal was agreed in November 2016. That has certainly been a perennial problem for Opec in the past, but it may be much less of a problem in the coming months. That’s not because of some new-found sense of collective responsibility so much as the fact that those countries most prone to flouting their pledges simply can’t do so at the moment. They are already producing at, or very close to, full capacity. Sure, Iran and Iraq are both planning to add additional new facilities this year, but they are probably the only ones. Recent unrest in several Iranian cities prompted fears of disruption to the country’s oil supply, but a much bigger threat comes from any toughening of U.S. sanctions, which could once again target buyers of Iran’s crude. President Trump’s antipathy towards the Islamic republic may threaten even the current level of production. Elsewhere, Nigeria’s big new offshore project, the 200,000 barrel a day Egina field, is now not expected to start producing until late in the year, so any increase there can only come from the uninterrupted operation of existing facilities, which proved impossible to achieve in 2017. As for Libya, its oil infrastructure is showing the strains of years of underinvestment in repair and maintenance. Output is unlikely to grow much from the current level of around 1 million barrels a day and the risks are skewed heavily to the downside. 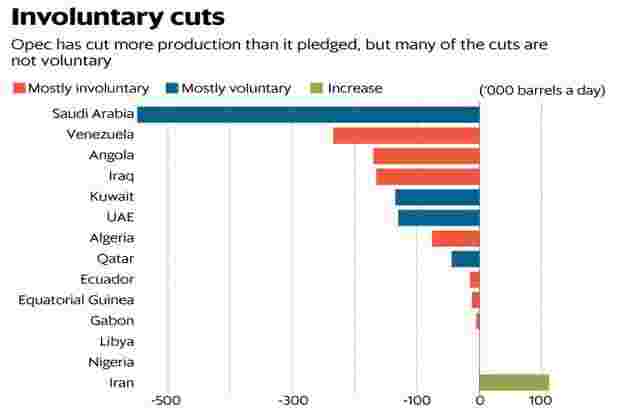 The only Opec countries that have made significant voluntary cuts are the Persian Gulf Arab nations -- Saudi Arabia, Kuwait and the United Arab Emirates. But these are the very countries that have a history of abiding by their output targets. The likelihood of them cheating is much lower than for most fellow members. When it comes to the non-Opec countries, let’s be honest, the only one that really matters is Russia. It is the only country that pledged a large voluntary reduction, all the others were either tiny, or the result of natural declines that cannot be reversed quickly. Will President Putin renege on the deal once re-elected? I don’t think so. To do so could endanger the arms and investment deals signed during the Saudi king’s visit to Moscow and weaken Russia’s burgeoning influence in the Middle East. That still doesn’t seem a good trade-off. The only other pledges from Opec’s friends for output reductions of more than 20,000 barrels a day came from Oman, Mexico and Azerbaijan. Of those three, Oman has a history of working with the producer group when times are particularly tough. The other two have rebranded natural declines in their output as “cuts." 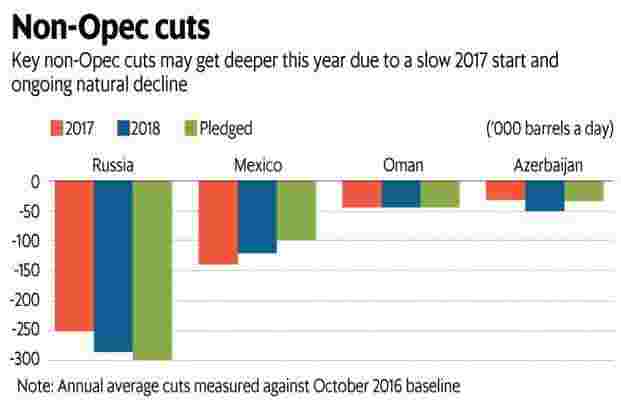 Those four countries taken together could actually see lower output this year than last year, given Russia’s gradual implementation of its cut, stabilization in Mexico and Oman, and continuing decline in Azerbaijan. What about the other risks to the deal? 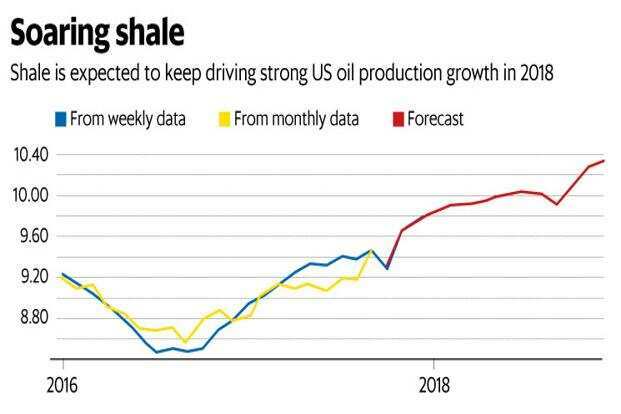 Capitulating in the face of surging shale supply would also be a very difficult step for Opec to take. It would be a huge personal blow to Saudi oil minister Khalid Al-Falih and to Crown Prince Mohammed Bin Salman, the architects of the policy. Not impossible, but perhaps the end of Opec as a meaningful contributor to oil price formation.